From time to time, car manufacturers give journalists the chance to catch up on cars they haven't had a chance to drive. 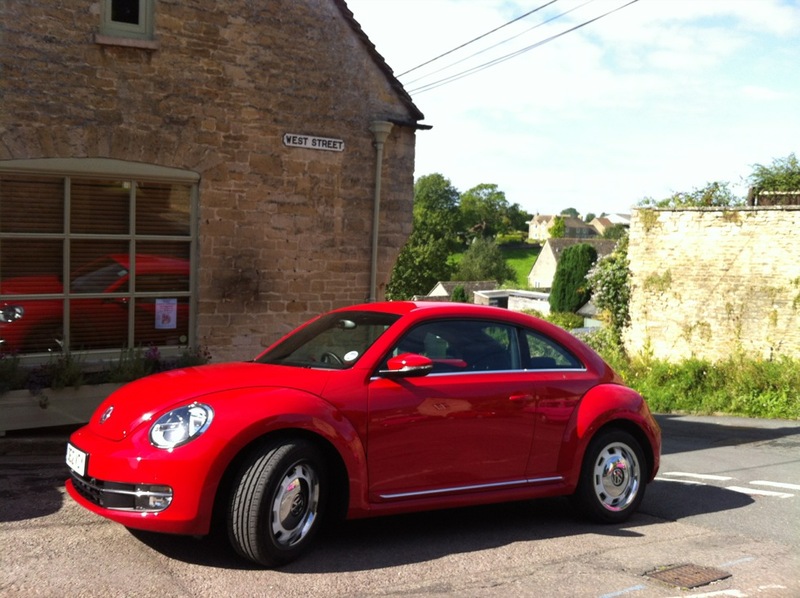 VW very kindly invited me to a hotel near Tetbury in Gloucestershire. We could come and go as we liked and try everything on display. I jumped at the chance to get into some VeeDubs and to chat to the ever-friendly and helpful press team, as well as catching up with some fellow scribblers. 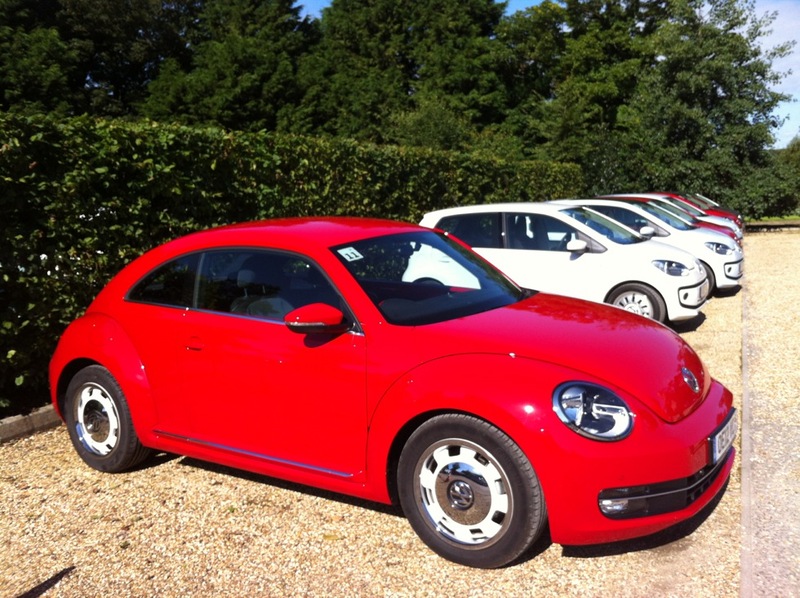 I quite like the new more squared-off design, although the Beetle does look big, especially lined up beside the dinky ups! (see left). This one was a delicious red, that made my mouth water like ripe cherries. Inside, it’s got lots of shiny painted metal and silvery bits. 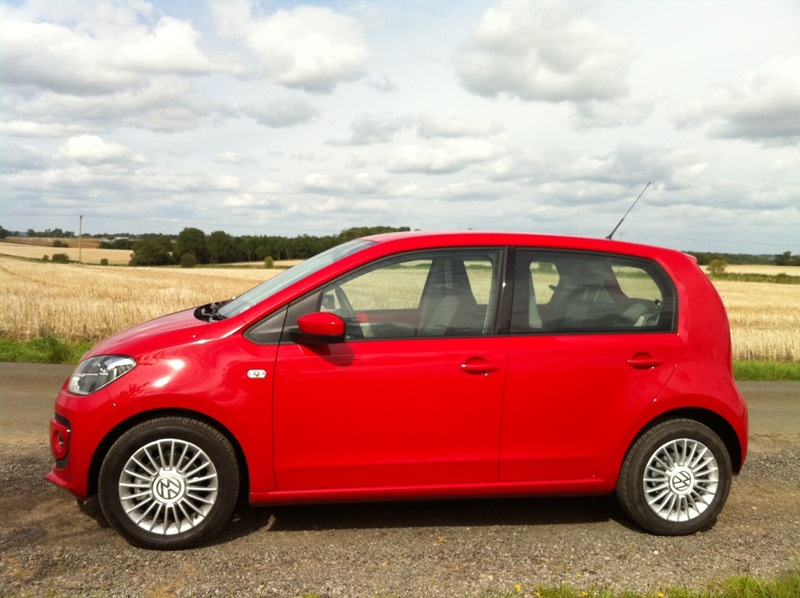 I drove one at the SMMT Test Day in May and found myself underwhelmed. I wondered if it had been because I was driving on the serpentine hill course which suits more sporty machines. 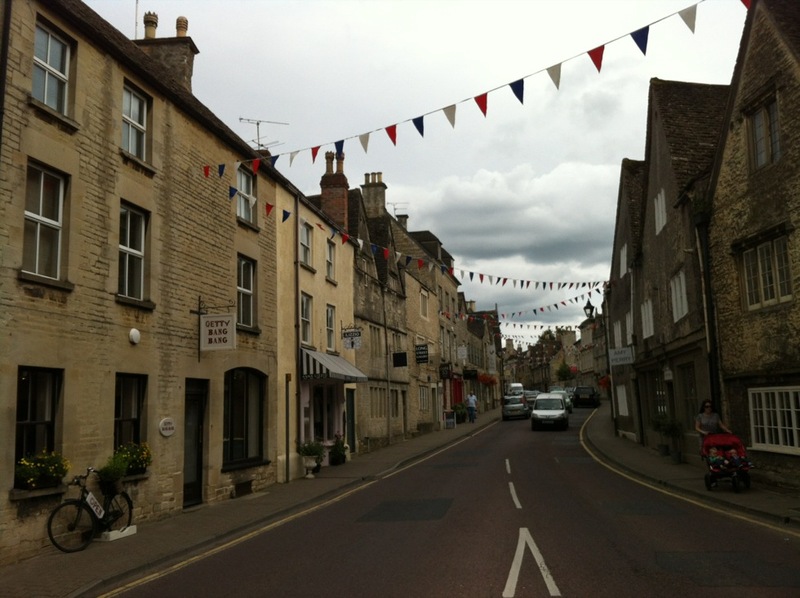 This time I took a gently twisting country road to Tetbury and through the town. 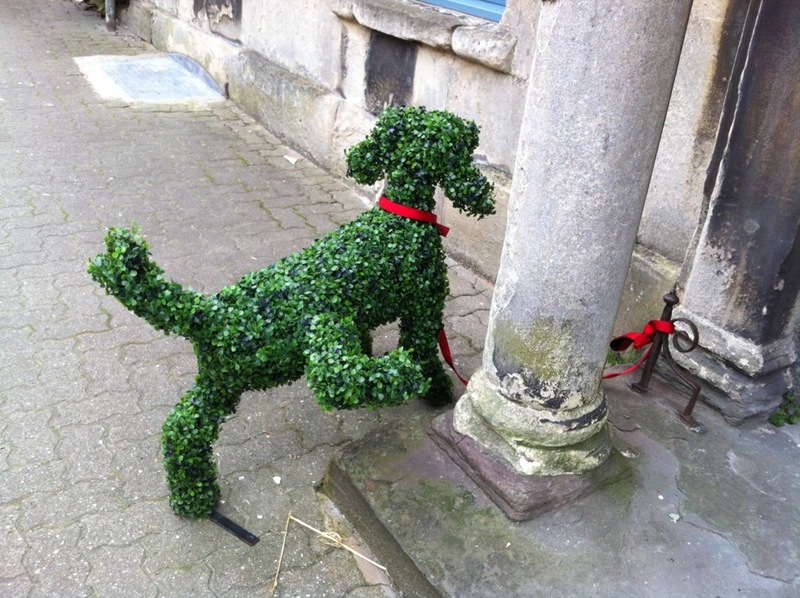 Lots of people gave it admiring glances (still mainly women, despite the attempt make it more gender neutral). It still wasn’t fun, though. The clutch and brake are too light and you can feel and hear the wheels jiggling about. The 2.0-litre diesel in this one was very discreet about its nature, but lacked oomph. I also found it surprisingly difficult to place when parking – you can’t see where those sticky-out arches are. 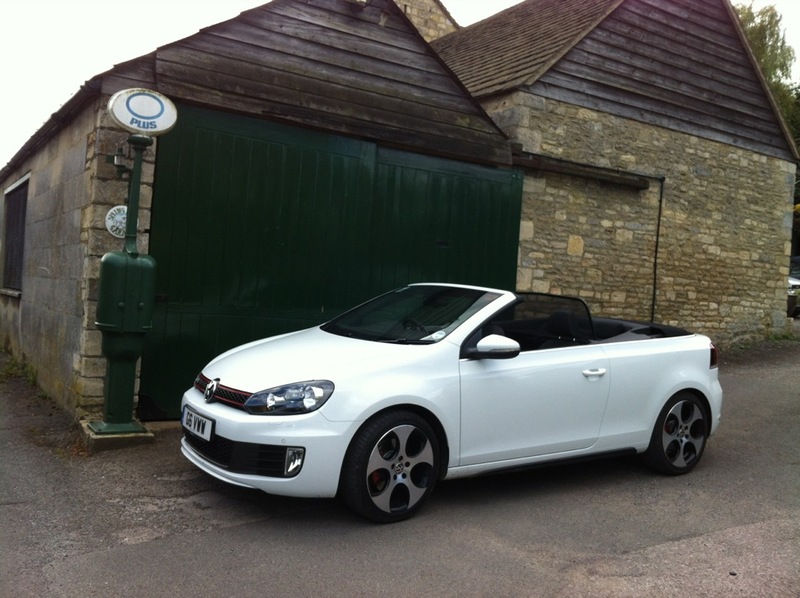 The sun was out, the roads were clear, who wouldn’t enjoy driving a GTI Convertible with the lid stowed? The DSG gearbox freaked me out for a while. I’m used the cars going RRRA, RRRA, RRRA as they go faster. Even CVT gearboxes have steps programmed into them to create familiar ‘gear’ steps. This one is so smooth, the engine just goes rrrrRRRRRR (Pity I only have two sizes of type here). It just keeps accelerating – like an electric vehicle. It does have paddles on the wheel so you can change down ahead of a bend or in advance of an overtaking manoeuvre if you choose. I preferred that extra control on some of the sweeping downhill bends, I could feel the car being pushed over the white line by the centrifugal force (understeer), but it was no problem to lift off a little. The engine is fairly quiet, but I found the drone at 1,000-2,000rpm irritating. 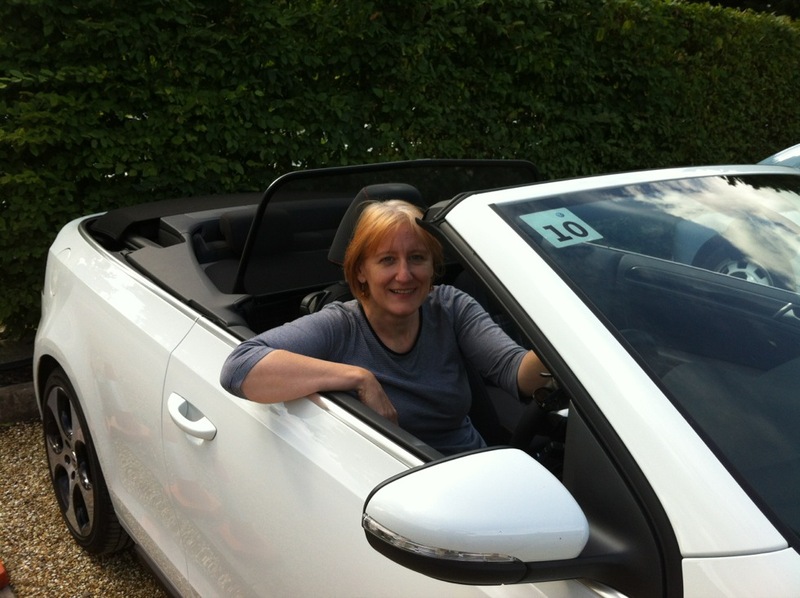 The sound at 3000-plus is much more attractive – my fuel consumption would be disastrous. 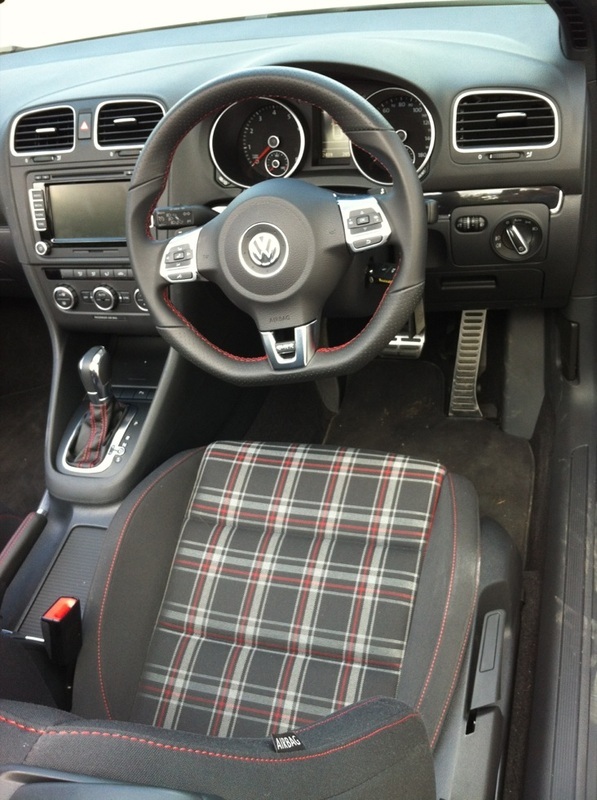 I like the classic tartan seats (an homage to the original) and deep binnacles for the dials. But I felt a bit like a child in daddy's car. This car is BIG. When we took the pic, I had to sit up on the side of the seat to be seen. The Passat strikes me as a very sensible car. It’s practical, smart and executive for the price. 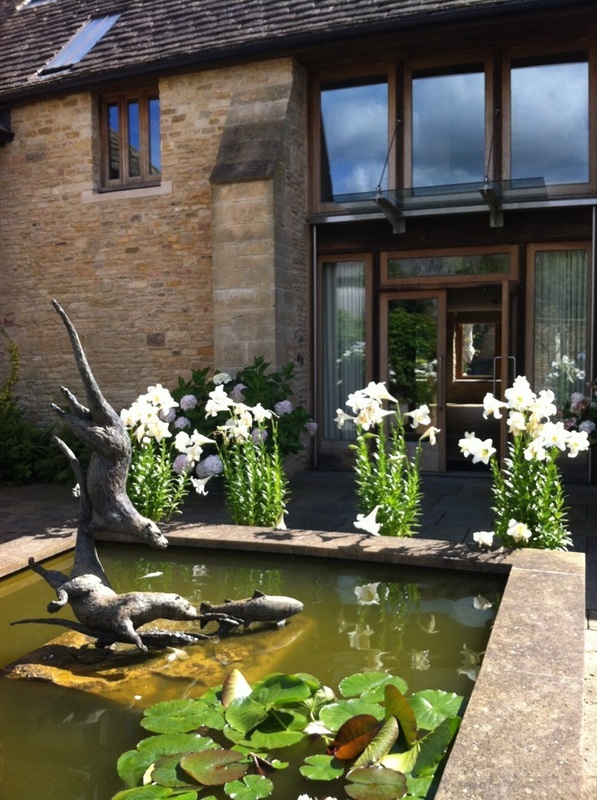 I imagine buyers choose it on the grounds of what they need – not just what they fancy. 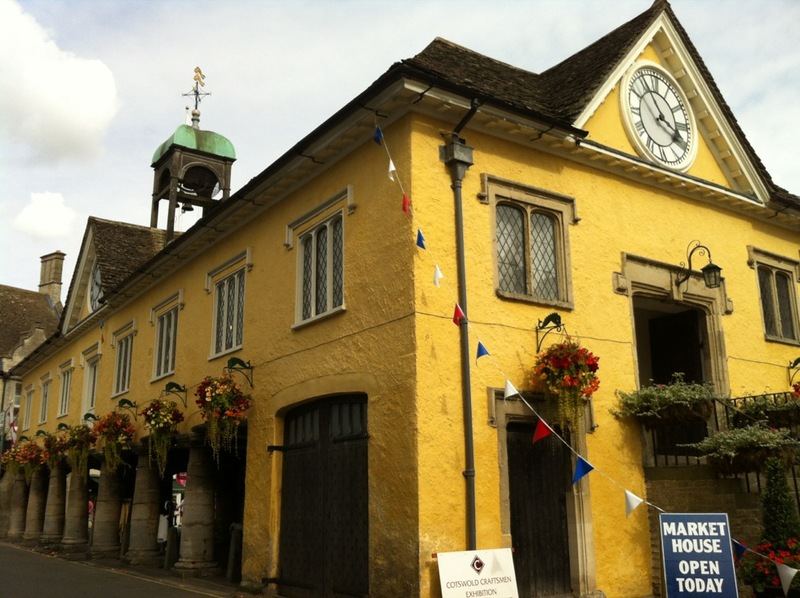 As I drove around the Cotswolds, I found myself thinking it was a shame the Americans are so prejudiced against wagons, because this four-wheel-drive estate would have suited me perfectly in Ann Arbor. It's a shame they don't like diesels, either, because this is a smooth, quiet car with lots of pull. Then the sat-nav took me down a tiny road with a broken-up road surface just like typical Michigan black-top. The Passat’s firm ride punished my backside and I remembered why American cars have such a cushy ride. One of those map things would have been handy. I found myself heading up a narrow lane with dry stone walls on either side, and at one point I had to reverse out of the way of an oncoming tractor. 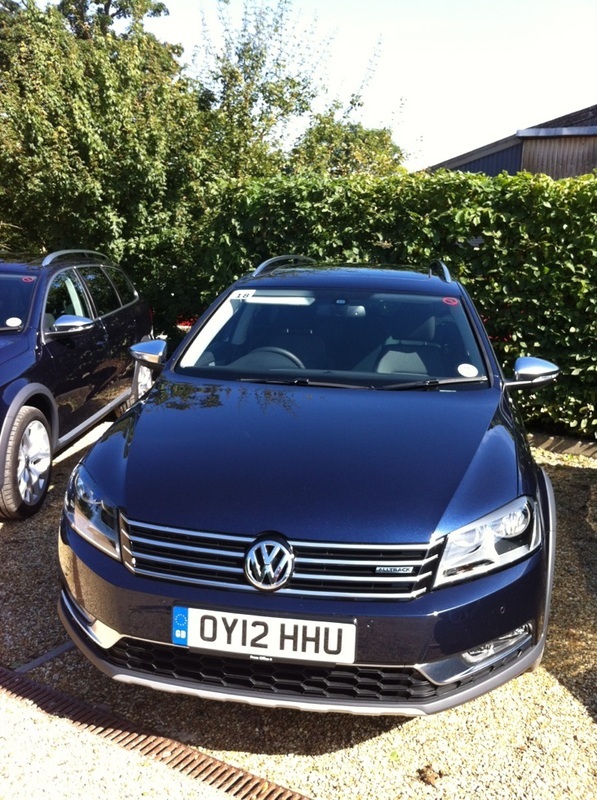 The Passat proved extremely manoeuvrable, though, with excellent visibility all round. I’d be very happy with one of these. Oh, and the fuel consumption is 40.4 urban/56.5 extra urban/49.6 combined. The Yanks would never believe it. I like the graceful arc of the CC’s roof and its enormous boot, but the cabin felt claustrophobic (and I’m only 5ft 6in). 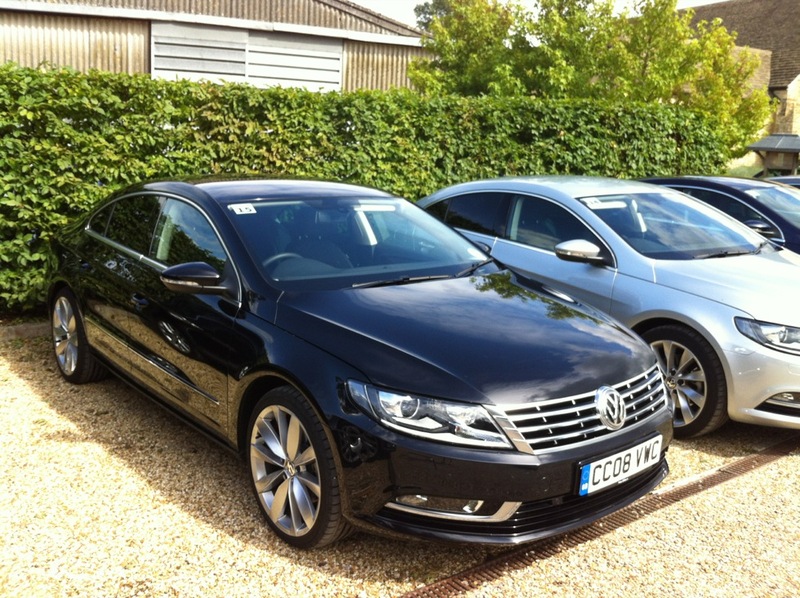 Very smart-looking again with a sliver of matt steel across the dash like the Passat. The driver's seat had lots of adjustments, but I couldn’t get comfy. The seat was hard and so was the ride. It's handsome, but I don't want one. I wanted to try an upsale up! after our fun trip to Wales in a Move up! (Click here for more). As I expected, the 74bhp High up! was much peppier than the 59hp, although a little pricier (The Move up! is £8970). The official fuel consumption is 55.4mpg urban/76.3mpg extra urban/67.3mpg combined, although What Car? puts the True mpg at 47.1mpg. It's a little tinny, but funky. 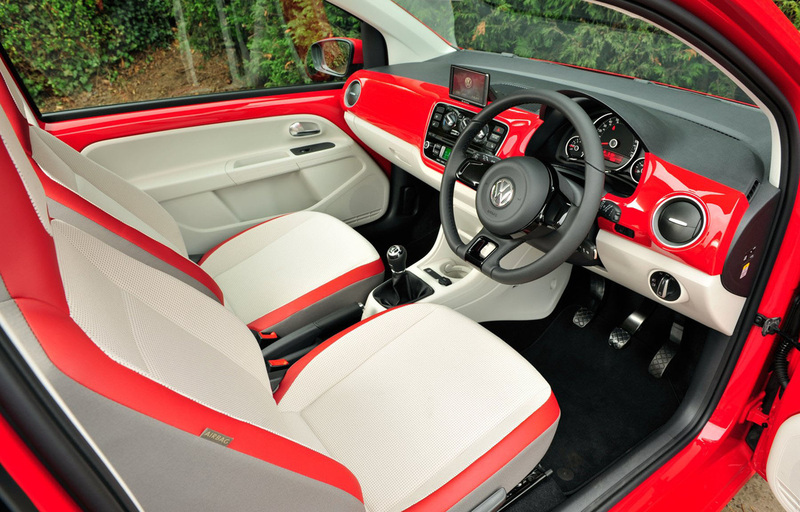 The two-tone interior is much more attractive than the grey plastic in the one we drove. I'm waiting for the northern version - the Ee-up!